The Lap App Portable Table for applique, hexies, paper piecing, etc. Portable table for unlimited sewing tasks while in seated position. 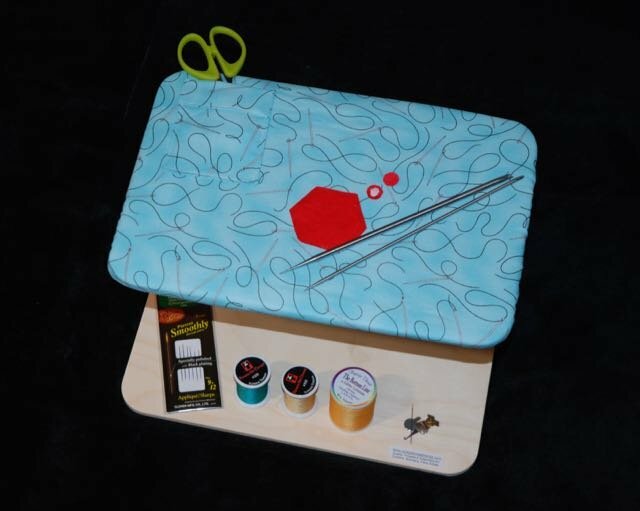 This small adjustable lap table provides a rest for hands making it ideal for appliqué and handwork--a mini workstation! The base, which sits in one’s lap, measures 12″ x 8″ includes 3 spindles for thread storage and an extra strong magnet to prevent needles from getting lost. The center pedestal measures approximately 5″ high and can be adjusted in multiple directions – up/down and forward/backward. The rectangular top surface also measures 12″ x 8″ and pivots to be flat or diagonal to suit the application and the user’s preference. Each Lap App comes with a 100% cotton, padded cover that is both removable and washable. The cover features a pocket for a small pair of needlework scissors. Handcrafted in the U.S.A.; available HERE for Canadians! Extra sewing notions displayed in image are available here as well: Clover needles, needle threaders, Kimono silk thread for appliqué, Bottom line thread for paper piecing, Perfect Scissors! Fabric likely will NOT be as shown in image. However, feel free to preference a favourite colour in the product note box above and we will accommodate whenever possible.